← New Happy Hour Venue: Liberty Bar! Armando is our bartender “extraordinaire” at Liberty Bar — our new Happy Hour home. Born in San Antonio, he’s spent a good part of his life here. As a young child he moved with his father to Waupaca, Wisconsin, and from there to Colorado Springs, where he went to high school. He attended the University of Memphis for a few years, but came back to San Antonio and graduated from Texas State with a degree in music composition. He has been living in San Antonio since, in the downtown area. Armando has lived in King William and Lavaca, and recently moved to Dignowity Hill, which is on the other side of the highway near the Alamodome. He’s enjoying his new neighborhood because the ‘vibe’ is very similar to Southtown, and it’s just a short bike-ride away from our neighborhood, which he loves. 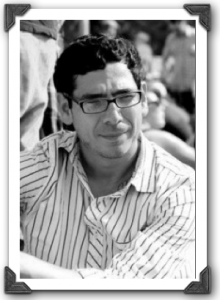 Armando is a musician and writer, and spends much of his time dedicated to those passions. He teaches piano lessons at the Guadalupe Cultural Arts Center, which is an organization that promotes the arts and art education. He loves working at the Center and with its patrons, who range in age from young children to senior citizens. He writes a music column for Art Magazine San Antonio, a publication that is available in both print and on the internet. He’s looking forward to South by Southwest — a two week music festival in Austin. Bands from all over the world converge on Austin and play at indoor and outdoor venues throughout the festival. Armando will be attending many of the performances and writing reviews and articles that will be published in the magazine. Because of his interests in music, writing, and film, he’s always looking for projects. He and another San Antonio artist are currently planning a new venture. They have warehouse space in Lavaca in which they’ll host musical performances that will be recorded and posted on their upcoming website, deafmoose. The venue will also host art shows. Armando has been working at Liberty Bar for six years, first in its original location on Josephine Street, and now in its current spot in King William. Liberty Bar has always been a ‘hang-out’ for artists and musicians, which makes it a perfect place for Armando. And he believes that Southtown — because of its abundance of resident artists — is the perfect place for Liberty Bar. In his free time, Armando loves to read, especially poetry and classic literature (he had a copy of Farewell To Arms with him when we got together for an interview). He hopes to write a novel soon. He also loves hanging out with Julian, his five year old son. Armando is a regular at our Happy Hour get-togethers, behind the bar offering up libations when we get together each week. Be sure to introduce yourself to him — he’s looking forward to getting to know us! Originally published March 6, 2013, in the Lavaca & Friends Happy Hour update.